May 30, 2012 - FedEx announced that it has signed an agreement to acquire the Brazilian transportation and logistics company, Rapidao Cometa Logística e Transportes S.A., the latest step in FedEx’s strategy for profitable growth in Latin America. The acquisition will further enhance FedEx Express international and Brazil business offerings and continues a long-term commitment to the growing Latin American region. This acquisition will afford FedEx Express’s customers access to Rapidao Cometa’s nationwide domestic transportation and logistics network. FedEx expects that the transaction, which is subject to customary closing conditions, will close in the third quarter of 2012. The acquisition of Rapidao Cometa, which has been one of FedEx’s authorized representatives in Brazil for the past 11 years, will supplement the FedEx Express service portfolio in Brazil and continue its Latin America expansion through key strategic investments. “We are delighted that Rapidao Cometa will be joining FedEx Express. Brazil is a market with tremendous growth potential—both in the overall economy, as well as in the logistics sector. The acquisition of Rapidao Cometa—one of the largest logistics solutions providers in Brazil—is in line with our long-term strategy to grow our Latin American business and better serve our customers seeking to enter or expand their businesses in the Brazilian market. FedEx will now be able to provide a more comprehensive portfolio of services in Brazil, including international air express, domestic ground and value-added services such as supply chain and logistics solutions,” said Juan N. Cento, president, FedEx Express, Latin America and Caribbean. After this transaction is completed, FedEx Express will be able to seamlessly offer all international services to Rapidao Cometa customers, who will have direct access to the FedEx international network connecting more than 220 countries and territories worldwide, enhancing customers’ business flexibility and speed to market. FedEx customers will have access to domestic package and freight services, logistics and distribution services. •Approximately 9,000 employees across Brazil. The integration of the logistics, distribution and express businesses of Rapidao Cometa will be achieved in phases over a period of 18 to 24 months after closing and will result in an extensive and competitive FedEx network and portfolio throughout Brazil. Rapidao Cometa is one of the largest logistics solutions providers in Brazil. The company offers a variety of high quality integrated air/freight transportation and logistics solutions, and holds ISO 9001, ISO 14001 and OHSAS 18001 certificates. Rapidao Cometa has the capacity to reach more than 5,300 locations and serves all states of Brazil, in addition to more than 220 countries around the world, by way of an operational agreement with FedEx. 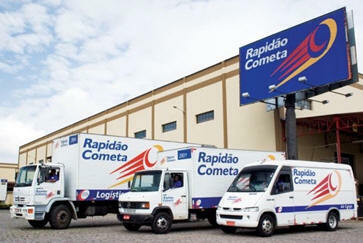 Rapidao Cometa currently has more than 17,000 clients, who are served by approximately 770 vehicles and trailers and approximately 9,000 team members nationwide and handles more than 12 million deliveries per year, through its strategic network made up of 45 branches and approximately 145 distribution points across Brazil.